WAI honors individuals who contribute to the technical, manufacturing, and business information it collects and disseminates. Top honors include the Mordica Memorial Award and the Donnellan Memorial Award. Additional awards are presented annually in the ferrous, nonferrous, electrical, and general sectors. 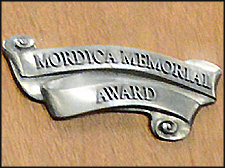 The Mordica Memorial Award, given as a tribute to The Wire Association International's founding president John Mordica, is presented to honor an individual who has made contributions to the wire industry's base through research, development, innovation, or other technical pursuits. The Donnellan Memorial Award, given as a tribute to J. Edward Donnellan, former Executive Director and Executive Secretary of The Wire Association International, is awarded for an individual's voluntary contributions to the Association. The President's Award is given annually to an individual(s) in recognition of special service to the Association. Gold medals are presented to authors of technical articles within the ferrous, nonferrous, electrical, and general industry segments. Honorable mention are presented to authors of technical articles within the ferrous, nonferrous, electrical, and general industry segments. Silver certificates are presented to authors of technical articles within the ferrous, nonferrous, electrical, and general industry segments.